There are just a few places in the world where one can visually experience Christ’s Passion, the suffering of Christ between the night of the Last Supper to His death; one of those places is Guatemala, in Central América. It is during “Semana Santa,” as Holly Week is called in Spanish, that the old rituals of the Spanish and the rituals of today’s Guatemalans blend, making a unique experience for the visitors. “Semana Santa” which starts on Palm Sunday and ends on Easter Sunday, is also a colorful time in Guatemala. The flowers are in bloom and one can see the bouganinvilleas cascading over the walls of many houses and rows of blooming Jacaranda trees at both sides of the streets, tinged in the color of lent, which is purple. The flowers outdoors blend perfectly with the long narrow curtains hanging from the ceilings of the churches and with the elaborate casullas (cassocks) of the priests, which are of the same color. Inside the thick walls of the churches impregnated with the smell of incense and Corozo (a flower) one could hear organ music and singing and see hundreths of people from all over the world kneeling together at the foot of the gold gilded altars, their heads bow in prayer. “Semana Santa” ends La Cuaresma, a name given by the Catholic Church to the 40 days of penance when all Catholics are required to eat fish on Fridays, recite stipulated prayers on stipulated days, attend retreats, go to church and have a general confession. La Cuaresma starts with “Ash Wednesday,” the day every Catholic is reminded during mass that “polvo eres y en polvo te convertiràs” which means: you were made from dust, and when you die you will return to the dust” as a priest paints a cross with his thumb on each parishioner’s forehead. The word “Cuaresma” comes from the Greek word “Tessarakoste” which means forty and it was the name given to the Spring season. During the fifth Century, however the Catholic priests inspired by St. Leo, who in 461A.C. asked his followers to fast during those forty days, declare La Cuaresma a time of penitence and fasting for all Catholics. For the “Chapines” as the people from Guatemala call themselves, Semana Santa is also a quiet time. The traffic is slow, the Catholic schools and some public offices are closed, and because of it one is forced to brake his or her daily rutine. Many people take vacations and go to their farms, others visit the different beaches. Ons the spiritual side, the priests encourage all Catholics to be quiet that week, to meditate on Christ’s passion, and to pray. Semana Santa is also a very important week in Guatemala. It is the week for the processions. 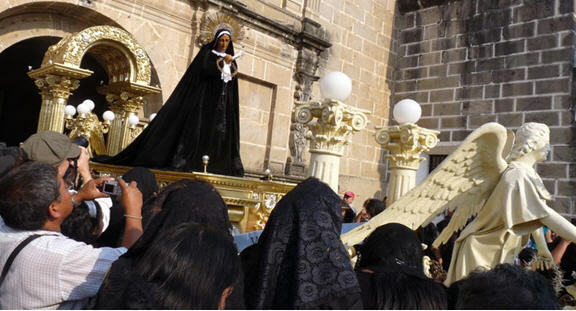 From Palm Sunday to Easter life-size statues of Christ, the Virgin Mary, María Magdalena, Saint Juan and different angels are carried in andas (big wooden platforms) that are paraded in processions from different churches carried on the penitents’ shoulders. The first procession, on Palm Sunday is the “Borriquita,” (the donkey) it represents Jesus mounted on a donkey entering Jerusalem. The procession is greeted with palms by people standing on the streets. Later, in the different masses, palms are blessed in a ceremony in which people hold ornaments made with palms and the priests go around the church sprinkling them with Holly Water. From Monday through Thursday the streets in Guatemala City are crisscrossed by different processions of Jesus Nazareno (Christ carrying his cross) from different churches. The processions are followed by a band of musicians playing elaborate marches in their wind instruments to mark the steps of the people carrying the different statues. The best procession of the week is “El Santo Entierro,” (The Holy Funeral) wich is accompanied by cucuruchos (as the penitents are called) dressed in white cotton robes with black hoods over their heads. Because the procession is in honor of Christ, some processions don’t have music all one can hear is the sound of the Matracas, wooden crosses about one feet long that have metal rings in each of its points. When the Matraca is shaken, the ring hitting the wood makes a crackling sound. 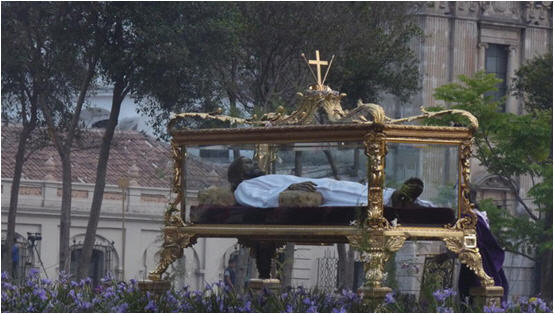 Hearing the metallic buzzing like sound as we watch a life-size image of “El Santo Entierro” (Holy Funeral) which is represented by a statue of Jesus laying inside a chrystal urn, is very impressive. There are many “Santo Entierro” processions on Good Friday all over Guatemala, but the most complete is the one from the church of Santo Doming in Guatemala City. The Statues, are hand made, carved from wood and date from the XVI Century. The life-size statues represent the “pasos” of the Via Crucis. To see this procession for the first time is very impressive. Some churches, like “La Recoleccion” also in Guatemala city do not use an urn. They just lay de image of Jesus on top of a platform. 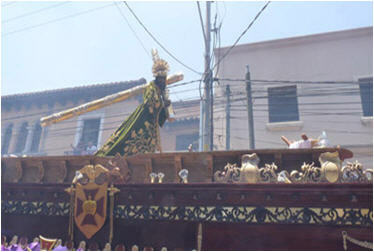 The “Santo Entierro” procession always have an anda, carrying the Virgin Mary, following him. The origen of the processions is very old. According to the history books they originated in the IV Century after Christ, just a short time after the Emperor Constantine of Rome accepted the Christian religion. They continued during the middle ages. When in the year 1555 A.C. the Spanish Real Audience established a kingdom in Guatemala, the King Carlos I allowed some conquerors, some monks and some soldiers to remain in Guatemala permanently. The Spanish cleric continued the processions.